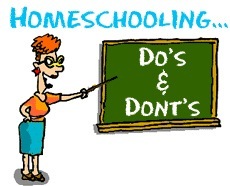 Have you ever wished there were a list of things you should do or definitely not do when beginning homeschooling? Don’t worry, you’re not alone! Even veteran homeschool mom’s are doubt themselves at times. When I first started homeschooling I asked everyone I knew which curriculum to use, what days to homeschool, which subjects to teach, and how I would know if my kids were doing okay or not. I spoke with several veteran homeschool moms and they all had the same advice. Have fun with your children, enjoy the time while they’re in your home, and use whatever works best for you! Well, as a first timer, and a type A personality person, those words weren’t exactly comforting to me. I wanted a well laid out action plan. I wanted a curriculum that would tell me in specifics what to do, when to do it, and what to say. I wanted something that told me how long to do each subject, and how many days to do it. Unfortunately, and fortunately, there just isn’t anything out there like that. Honestly, there really isn’t one absolutely perfect curriculum that you need to run out and get right now. And ironically, after homeschooling for 9 years I find myself starting to sound like those other veteran mama’s who told me to just do what works best for our family. Now, that said, I realized that there were others out there like me who needed at least a starting plan to follow until they could take the reigns on their own. And so I wrote Homeschooling 101: A parents guide to getting started. It’s a great book, with well laid out plans to help you get started. And hopefully it will also give you the confidence to venture out on your own and try new things, and eventually get into that lovely homeschooling groove where you’re family is thriving. As I thought about what it was like when I first started out, I wanted to share a few do’s and don’ts in regards to homeschooling to help anyone who might be questioning themselves at this stage in the game. So here are just a few tips that I’ve learned over the years, and hopefully they will encourage you too! Do pray about homeschooling, curriculum choices, and any other decisions you have on your plate. Homeschooling isn’t something to just jump into. It’s a huge commitment and should not be taken lightly. I highly recommend praying about your homeschool, your curriculum, your schedule, and everything else! Do discuss issues with your spouse. One of the best things that I did was to involve my husband in our homeschooling process. For the first few years I picked curriculum and if something didn’t work it kind of fell on me. Now we discuss pros and cons of the ones we like, and then we choose our curriculum together. It takes a lot of pressure off of me, and when we have school we can discuss them together. Do research the various curriculum choices. Don’t just buy something because a friend is using it. Take the time to research the various curriculum out there, and really try to choose something that will work for you and your children. A great place to find reviews are in my homeschooling forum area and also at www.homeschoolreviews.com. Several people have chimed in over the years with their opinions to most of the curriculum out there today. Here you can see pros and cons, then decide which things you can live with, and which you don’t want to have to deal with. Another great place to check out materials in person are homeschool conventions. You can do an online search for homeschool conventions in your area to get a hands-on look at curriculum, and ask questions from the various vendors as well as attend workshops to learn more about a variety of topics. It can definitely make choosing curriculum easier! Do schedule in some “free” days to play catch up if you get behind. I learned early on, that my vigorous schedule didn’t always pan out in real life. And you will get behind it’s inevitable, everyone does, even traditional schools. Don’t freak out about it, just plan a regular catch up days into your schedule, so that you can catch up on work. And hey if you’re on schedule you can enjoy a day off! It will relieve a lot of the stress that keeping up with a demanding schedule can bring on. Do check out homeschool conferences and co-ops in your area. I already mentioned this a little bit above, but I wanted it to have it’s own bullet point. Conferences can be a great way to connect with other homeschooling families, vendors, and they usually offer a wide variety of workshops as well. It’s a great place to talk to vendors one on one and ask any questions you might have. Co-ops are also a great way to meet other homeschooling families, participate in fun activities for your children, and support for those rough days. Do create a vision statement for your homeschool, and create a list of goals that you want to achieve each year. We created a vision statement when we first started, and I can’t tell you how much it has helped. Whenever we’re on the fence about a certain curriculum, or activity, we check our vision statement. We can see if what we’re looking at fits into our vision or not. From there, you can include or exclude curriculum, activities, and the like based on what will help you attain your homeschooling goals. Don’t compare your kids to other people’s kids. This really goes for all parents, homeschooling or not. But comparing your child’s development with another’s is not a good practice in any setting. Everyone develops at different rates, and the wonderful thing about homeschooling is that it’s flexible enough to cater to your child’s needs. They might be a super star ahead in everything, or possibly a bit slower to develop, and more common yet are students who excel in one area, but need help in another. Don’t worry about your neighbors kids, just focus on giving your child the best education you can and encourage and support them along the journey! Don’t let your curriculum dictate your day. Sure it’s great to follow along with a planned curriculum, especially if you like it and it has worked well for your family. But don’t feel like you’re chained down by it’s demands. Make the curriculum work for you, and fit it into your schedule. If it calls for 5 days per week, but you only have 3 spots open, then do it 3 times a week. See if you can combine lessons so you don’t fall behind, or possibly stretch it out over two years to fit it all in. You might even consider…gasp…not finishing the curriculum! Did you know most public school classes don’t get through an entire book in one year? Guess what? It’s okay! I have taken curriculum before, and just pulled out the sections that I wanted to cover for that year and skipped the others. Just decide what you want to teach from that curriculum and schedule it in to fit your needs. Don’t jump into homeschooling without careful consideration and prayer. Homeschooling really is a calling, and it’s not to be entered into lightly. Make sure to consider finances, family values, goals, and time management. You can expect to spend around 5 hours per day homeschooling, and possibly more if you have planning and preparing to do. Again I encourage you to discuss the decision with your spouse, pray about it, an follow God’s leading for your family. Don’t try and teach/learn absolutely everything about everything. As a blogger when I’m surfing online I’ll see tons of great ideas and activities that other homeschooling families do. It can easily make me feel inferior as a mom, and like I’m not doing enough with my children. Follow your vision and goals for your homeschooling family. Sure it’s fun to add in extra things here and there to add a splash of excitement, but don’t feel like you have to be doing everything every single year. Most of all, follow God’s leading in your homeschool just as you would for your daily lives and you can’t go wrong! I hope this post helped encourage some of you, and have a great week! 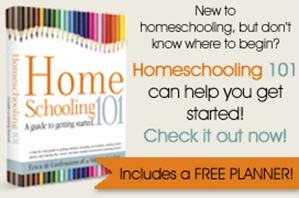 Looking for more in-depth help on getting started homeschooling? 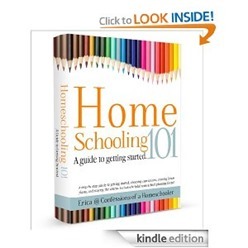 Check out my book Homeschooling 101! It’s a step by step guide to getting started, choosing curriculum, deciding what to teach, creating lesson plans, staying the course, and more! This post is very inspiring and exactly what I needded two years ago when beginning our homeschool journey. I still have a lot to learn… and there are days when I question my decision…. But I wouldn’t change it for the world! Thank you for this! As a soon to be homeschooling mom who is doing LOTS of planning, your site has been my go to for a lot of the preparation! This Is very helpful and also makes me realize even more than I am doing the right thing. Thank you for your continual support and encouragement. This is my second year doing homeschooling (first grade and pre-K). It is fantastic but so much work and I often find myself worrying. Your continual support with your blog posts are of great help! Thank you! I have only homeschooled for three years (K-2), but I have obsessed over curriculum each year. My mom, who is a former “real” teacher, finally told me, “It doesn’t matter what curriculum you use; it’s how you use it! Just pick one!” 🙂 I thought she was crazy, but now I’m starting to see the sense in it! Thank you for this Erica. Wise words and I will definitely try to follow your advice as we consider homeschooling for next year. I plan to use your forums to research curricula more, as well as check out your Homeschooling 101 offering. Oh wow, I totally get this! I wanted free time during the day, too! I seriously considered NOT homeschooling because I can’t stand clutter, and with a small house, I knew my kitchen would end up being taken over by homeschooling “stuff.” And honestly, the first year was a struggle for me to figure out how to get into homeschooling mode instead of stay at home mom mode. I still struggle with that! But I felt like God was leading me to homeschool and for now, at least, I feel certain it’s the right thing for us. I actually briefly put my daughter in school, but found I was just as tied down with getting her there, picking her up, doing school activities and projects, etc. Once you get into a groove with it, homeschooling can offer more freedom. Praying for you to have peace either way! This list is GREAT! I’ve only been homeschooling a year, and I really love it, but would’ve been great to hear these pieces of advice at the beginning! I’ve learned alot of these lessons as this year has passed…especially about not finishing a curriculum or just taking bits out….And also about the checking out different curricula options. I’m so glad I went to our state’s homeschool convention last May, because it gave me so much more to look at. (I’m very Type A-I like to have things planned out and know what all my options are). Just curious if you’d be willing to share your vision statement? I don’t really have one, and not sure how to create one, and just curious what other people’s vision statements are like. Hi Erica! I’m a homeschool newbie to four boys 🙂 I appreciate everything on this blog. The choices and opinions of all the methods and curricula have been a bit overwhelming so I am still trying to find my groove. I’ve been a very ‘boring-based, eclectic’ instructor although my aim was for ‘montessori, classical’. Lol! All the resources you’ve made available have brought the cuteness back into our classroom. You’re advice and shared experiences have been a virtual blessing. I too want to thank you for this post! This is my second year. I was starting to feel very doubtful and frustrated again about if this was right for us. We have had a lot of transitions and changes in our home in the last few months. We have 8 children. Three in collage, 2 in high school and the three younger ones are home schooled. Our 7th grader is doing cyber. The second grader is doing Calvert plus she has ODD and ADHD and 4 yr. Pre K. Plus for the last 4 yr. I had been watching five other children in which I have stopped. I really tried to doing every little thing from the books and didn’t realize I needed to make it my own. In turn we have fallen extremely far behind because I was going about things the wrong way with our seven year old. I still feel like a newbie trying to get in a grove but I know that our goal for our children to have a God sovereign heart is one. Not sure if I’m confident enough to go all on my own but who knows maybe some day! Thank you so much for you web site, encouragement, knowledge in homeschooling and Godly love.